Please click here to go directly to our Keep More of What You Make article in PDF. Business owners and executives understand the painful truth: taxes often eat up nearly 50% of their high-earner compensation. Once compensation is paid, a short list of deductions, losses, and credits are the only way to lessen the tax bite. This "everyone for themselves" approach to tax reduction has limited benefits. There is a better way. 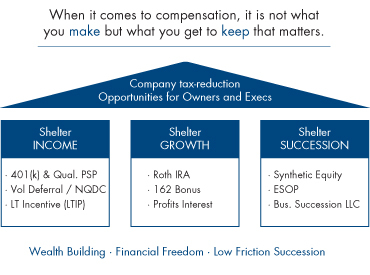 Private companies can introduce solutions to shelter income before the compensation is recognized, thereby enabling the owners and executives to reduce taxes in three ways. Some sheltering solutions delay and defer taxes on compensation income. Some sheltering solutions reduce and/or eliminate taxes on investment earnings. And, some sheltering solutions convert ordinary income to capital gains. 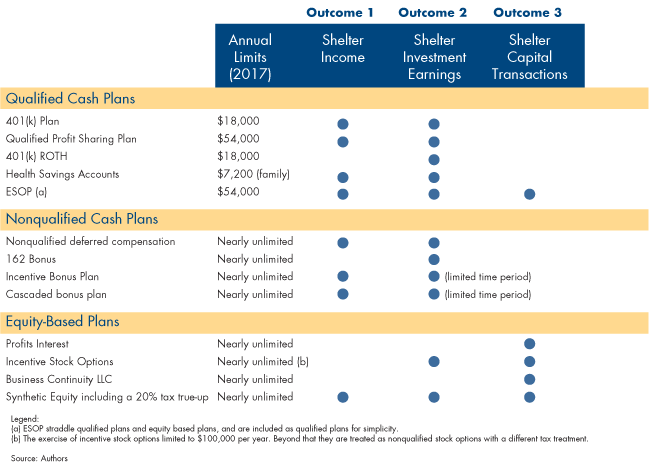 In this report, we describe how sheltering solutions, such as qualified profit sharing plans, 162 bonus plans, and business succession LLCs fueled by profits interests, can be used to reduce the taxes on income, investment earnings, and capital transactions. Our aim is to assist owners and key executives in private companies in their quest to achieve financial freedom, win the war for talent, and create a value architecture for achieving short and long-term strategic objectives. Sheltering solutions bind owners and executives to the company by providing them with the means to build long-term financial security and wealth. Nobody enjoys paying taxes. Perhaps that’s why the valuable opportunities hidden in the taxes owners and key employees in private companies incur on cash-based compensation are rarely fully recognized and exploited. Company-based sheltering solutions are the key to unlocking these opportunities. These are solutions that substantially lower the taxes on: personal income, typically salary and bonus; investment income, such as interest, dividends, and capital gains; and equity transactions, via direct or simulated ownership in private companies. Sheltering solutions help build the personal wealth of key stakeholders, including owners and executives, and enhance the stability and performance of the company itself. Taxation takes a huge bite out of owner and executive compensation. The federal income tax on cash compensation is nearly 40 cents on the dollar. Owners and executives who earn $100,000 lose $40,000 to taxes, leaving only $60,000 for savings and investment. This tax bite has long-term consequences. 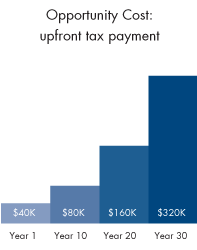 If the $40,000 tax could be deferred and invested at 7 percent, it would double within 10 years to $80,000. It would double again to $160,000 in 20 years, and again to $320,000 in 30 years. Talk about opportunity cost! Sheltering solutions help private companies win the war for talent, and drive business performance and results. They bind owners and executives to the company by providing them with the means to build long-term financial security and wealth. Sheltering solutions tangibly demonstrate an employer’s commitment to its employees — fostering employee loyalty and high-performing organizational cultures. Sheltering solutions help key employees keep more of their pay and grow their net worth. It is counterintuitive and often surprising to employers that the financial futures of their key executives are not assured. After all, these executives typically are well paid and enjoy valuable benefits packages. But the reality is higher pay almost always translates into higher spending, not higher savings. PwC’s 2017 Employee Financial Wellness survey revealed that 58 percent of employees earning $100,000+ consistently carry credit card balances, and that 33 percent of them find it difficult to make the minimum payments.2 When implemented properly, sheltering solutions will nudge key employees toward long-term financial wellbeing (see sidebar). Sheltering solutions help owners preserve the fruits of their labor when they leave their companies. They protect the proceeds of capital transactions, so that owners can afford to sell when the right times arrives. They secure the business, personal, and philanthropic goals of owners. And they maximize the rewards that owners work so hard to earn. Thaler applied the theory of nudging to retirement savings. He and economist Shlomo Benartz proposed a prescriptive savings program, called The Save More Tomorrow (SMarT) program, in which employees voluntarily commit to saving a portion of their pay—not immediately, but in the future when they receive a raise. Nonqualified cash plans These plans are “nonqualified” in that the company is not permitted to take a tax deduction on plan contributions (deferral, match, bonus) until the participant recognizes taxable income. Generally, no tax due on plan balances until the participant is paid out. These plans must be paid out in compensation (no transfer to self-directed IRAs). Further, these plans are subject claims of creditors in event of corporate insolvency. Tax-qualified cash plans These plans are “qualified” in that the company takes a tax deduction on plan contributions (deferral, match, bonus) before employees recognize taxable income. Generally, no tax due on plan balances until employee is paid out. These plans permit long-term tax deferral after separation via transfer to self-directed IRAs or other qualified plans. These plans are generally insulated from the creditor risk from the underlying company. Choosing the most beneficial sheltering solutions for a company is a function of which of the above three outcomes (or combination of outcomes) best fit the needs of its owners and key employees. For instance, a company heading toward leadership and capital succession in the near term will have very different needs than a firm that expects to maintain private ownership through several generations of management. A qualified profit-sharing plan (Q-PSP) is a highly effective income-sheltering solution for bonuses. In a Q-PSP, the company chooses the size and scope of its annual contribution up to the plan limits of $54,000 per eligible employee.9 For greater customization, a cross-tested Q-PSP can be used, in which, depending on the design, key executives can choose individually how much of the contribution will go into the Q-PSP. Q-PSPs can deliver tax savings of 30-40 percent. Instead of paying the taxes on a bonus in full and immediately, employees only pay tax upon withdrawals of the funds (starting no later than the year the participant reaches age 70.5, the trigger for required minimum distributions). In the meantime, these plans usually provide participants with the ability to direct their investment balances. Eventually, the funds can be transferred into a self-directed IRA, and the tax savings can continue on the majority of the balance for decades. When executives withdraw the funds after retirement, their total tax on the initial bonus can be materially reduced, assuming they are in a lower tax bracket at the time of distribution. Owners can use most of these solutions to lower their own taxes, subject to rules that vary by business entity. Typically, the owners of C corporations enjoy the greatest flexibility with regards to qualified plans; S corporation owners holding a 2 percent stake have some restrictions, and LLC owners, who are deemed to be self-employed, have the least flexibility. With these solutions, tax is paid by the participant up-front and then, subsequent growth is tax-deferred, or possibly tax exempt. Investment-sheltering solutions, such as a ROTH 401(k) and the 162 Bonus Plan, allow key employees to enjoy the exceptional benefit of tax-free growth on compensation after the initial taxation. With these solutions, tax is paid by the participant up-front and then, subsequent growth is tax-deferred, or possibly tax exempt. Named for the section of the IRS tax code that enables it, a 162 Bonus Plan is a particularly effective investment-sheltering solution that is built on a life insurance platform. The cash value of the life insurance policy can grow tax free or on a tax-advantaged basis, maximizing the power of compounded growth for decades. Companies can pay compensation, such as bonuses or a matching contribution to an executive’s deferral, directly into these permanent policies as a premium. It’s the combination of life insurance, tax-advantaged earnings, company match, and withdrawal flexibility that makes a 162 Bonus Plan so powerful. Take, for example, a 46-year-old executive with after-tax deferrals and company matches that add up to a $30,000 annual premium for 10 years. Let the compounding continue for another 10 years and the policy accumulates a cash value of $580,000 by age 65 (assuming a 6 percent annual return). This executive could take annual tax-free withdrawals of about $63,700 from the policy for 15 years until age 79 and still have the remaining paid-up life insurance coverage for years to come. The total tax-free distributions of $955,000 has been shown to be over 30% better than distributions from a taxable investment account with comparable assumptions. Hypothetical Illustration: 46-year-old, assumes standard underwriting using a common Index Universal Life Product. Sheltering solutions for capital transactions address issues with which all owners of private companies struggle—leadership and capital succession. 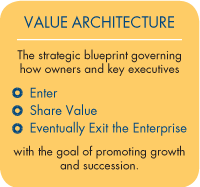 All private companies need a value architecture that defines how leaders become owners, how they share in the value they help create along the way, and how they exit ownership in style. In addition, private companies must be prepared for the incapacity or death of founders and owners, which can trigger major leadership and financial disruptions with draconian tax consequences. Sheltering solutions for capital transactions, such as profits interests, synthetic equity, and incentive stock options, can dramatically reduce the tax friction that occurs when new owners enter and existing owners exit the enterprise. Take the common example of a founder who wants her business to continue under its current leadership team in the event of her disability or death. The founder could leave capital in the underlying company to enable succession, but that traps the capital in the owner’s estate, making it unavailable to the succession team. Alternatively, the founder could acquire a life insurance policy with death benefits going to the company, but the payout can raise the value of the company, which adds to the estate tax burden and the price of a leadership buyout. Finally, the founder could award bonuses to the succession executives to enable the buyout, but that is cash compensation and triggers ordinary income taxes. What can the founder do? Will Hidden Taxes Derail Your Succession Plan? The tax bite of a traditional management buyout (MBO) can threaten capital succession - leaving a forced sale or liquidation as the default succession pathway. Consider a common plan. A founder sets up a stock appreciation rights (SARs) plan to get capital to key executives to enable the management buyout strategy. The company pays 40% ordinary income taxes on profits. Then the executives owe 40% ordinary income taxes on the payout of the SARs plan. Then the owner owes 20% capital gain taxes on the proceeds from the MBO. The result: the IRS gets the large majority of the value from the succession plan and the owner ends up with pennies or dimes on the dollar. Addressing this succession plan upfront can dramatically reduce taxes on capital transfer. One powerful sheltering solution the founder can turn to is an executive compensation LLC (also called a business continuation LLC). In this solution, a separate entity is established to hold the upside value of the company, which eases the process of leadership and capital succession. The upside can be delivered via profits interests, which transfer upside value in a new LLC without triggering any tax at grant. Furthermore, the value of profits interests at liquidation is taxed at the favorable capital gains rate.10 Alternatively, the upside can be delivered via a capital infusion derived from life insurance death benefits or disability benefits that are paid to the succession LLC. The ultimate paradox of business is that growth enables scale, but it also triggers complexity, which defeats scale. Ensuring that sheltering solutions work together in a harmonious way is not only good financial hygiene, it also is enormously important to business success. Working with a strong advisory team helps map sheltering solutions to the growing company. When private companies consider sheltering solutions, we always seek to direct their focus to first achieving maximum purpose, not simply maximum gain. The goal is to select and shape a set of sheltering solutions into a coherent tax reduction strategy that fulfills business and personal needs. Sheltering solutions are powerful tools, indeed. Be sure your company is taking full advantage of them. 1 Fidelity Investments, Fidelity Participant Marketing Analytics. Based on 410,000 financial wellness visits and 250,000 completed financial wellness assessments from 6/16/16 – 8/31/2016. 2 Employee Financial Wellness Survey PwC, April 2017, page 15. 3 For more information on the power of nudges, see Richard H. Thaler and Cass R. Sunstein,Nudge: Improving Decisions About Health, Wealth, and Happiness (Yale University Press, 2008). 8 The full FICA tax of 7.45% (combined of 6.2% and 1.45%) is assessed up to the social security wage base of $127,200 (2017). Above this amount, only the Medicare portion of 1.45% tax is assessed. 9 The $54,000 limit on a Q-PSP is inclusive of the $18,000 401(k) limit, if a 401(k) exists. 10 The Profits Interest: The Frank Lloyd Wright Approach to Ownership and Incentives, Mark C. Bronfman. See boldvalue website at www.boldvalue.com. 11 The primary asset held by a business succession LLC is often a term life insurance policy. Accordingly, the capital accounts of the individual members have limited value – making the buy-in and buy-out low cost and flexible as administered by the Managing Member (typically the owner of the operating company). 12 See Equity Rules: Shaping powerful equity models via Sell · Pay · Convey on the www.boldvalue.com website.